This entry was published on April 30, 2015 and was updated on June 30, 2015 / Mohamad Ramadan. 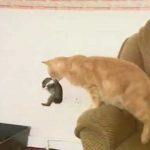 Posted in Cats & Kittens, Other Pets, pets stories and tagged adopt, Cat, cats, pet, petzooz, rabbits, تبني, سنور, قطاطيس, قطة, قطوسة. Bookmark the permalink.